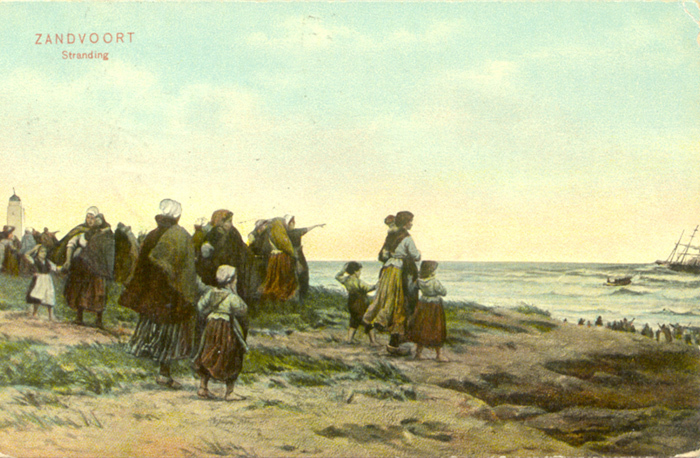 Zandvoort and its beautiful beach are now widely celebrated as places to go to for a relaxing holiday or even to indulge in sports or outdoor pastimes but as these old Zandvoort postcards show, for the natives of the village, the sea and the beach have for centuries been important as a source of work and income. The fishermen for example traded their fish with the merchants of Haarlem, Den Haag (The Hague) and Leiden as far back as the 18th century. 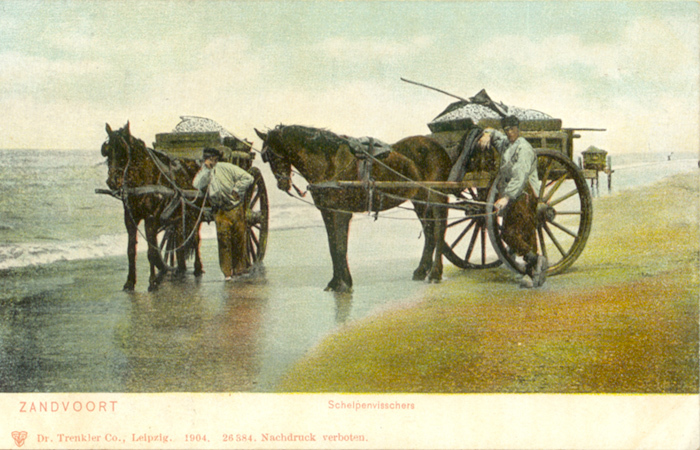 By 1921, however with the laying out of the Zeeweg, Zandvoort was well on its way to becoming a well-known seaside resort, and the village and beach gave themselves gratefully to the service of their visitors and the people of the town made the most of all the facilities. 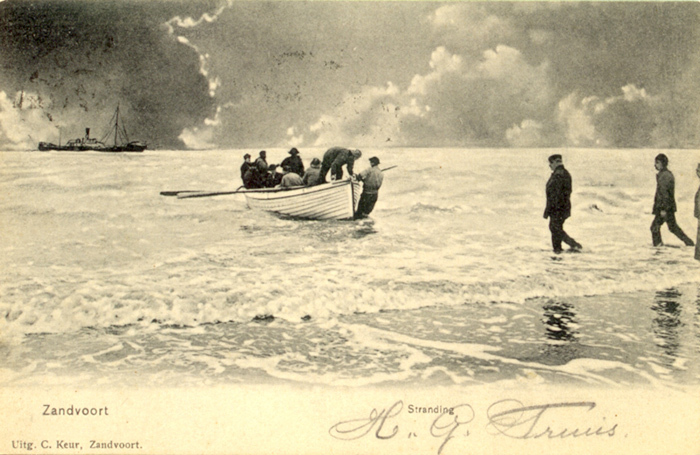 People come ashore to safety on the beach from their stranded boat in what have clearly been very rough conditions out at sea. Zandvoort today still has a lifeboat station or ‘reddingsbrigade’ which is available as a 24 hour a day emergency service. Each spring, the Royal Dutch Rescue Society (KNRM) organises its annual open Lifeboat day during which members of the public are allowed to look inside the rescue station and even take a look at some of the equipment. There are special demonstrations and interesting talks given which make for a very interesting visit. 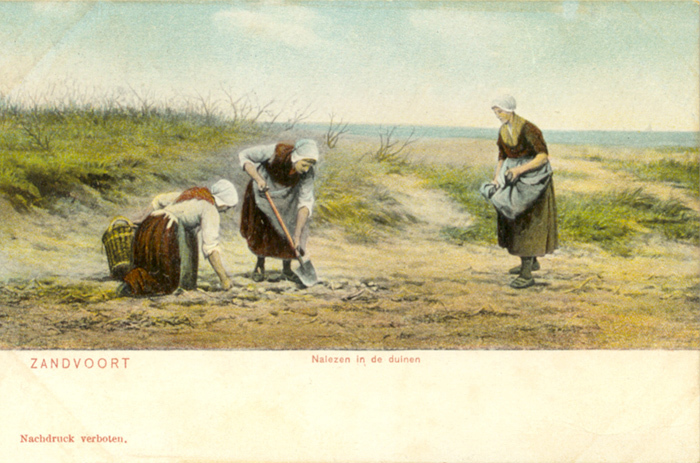 Women gathering in the dunes by the sea – Nalezen in de Duinen – I wonder what exactly they were gathering! In fact, even today, the dunes around Zandvoort are accessible through special entrance ways and are overflowing with both animals and plants. The most well-known area of dunes is the Kennemerduinen. It has a visitor’s center where you can learn all you want to know about the dunes.